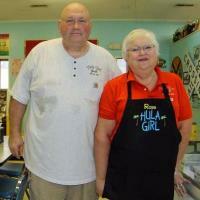 Hula Girl Ice Cream and Grill came from humble beginnings. The Selma restaurant, which serves burgers, hot dogs, wings and steaks, got its start as an ice cream stand that Rose Pittman and her husband, Ray, set up as a way to make extra money. In 2007, the couple started hauling the stand to festivals on weekends, but they grew weary of the travel. The owner of TWM’s Antique Mall in Selma allowed them to park the stand at the mall, where it was easy for residents, shoppers and passersby to stop by for ice cream. The Pittmans, who live in Kenly, operated the stand seven days a week from March through October, hiring staff to run it during the weekdays when they were at their regular jobs. They kept it going for four years until they were too tired to do it any longer. In 2011, the Pittmans were on the verge of going out of business when a small space became available for lease in the foyer of a West Railroad Street building that also housed Ginny O’s Gourmet Cheese Straws. The space had a narrow strip of floor occupied by a large cooler stocked with buckets of ice cream, and a counter-top just large enough for a cash register. The couple added hot dogs and hamburgers as a way to increase business, and put picnic tables, which seat about 50, on the front lawn. Behind the counter was a small-food preparation area. Ginny O’s moved out in 2013, and the Pittmans took over the entire building. They added grills and fryers, and expanded their menu to include dishes such as steak dinners. “We’ve been a full-fledged restaurant for two years,” said Pittman, 51. In 2013, Rose Pittman was enjoying cooking and Ray Pittman liked being his own boss. So she retired from her job as a guidance counselor at North Johnston Middle School, and Ray, 56, retired from his job in accounting so they could devote their time to the restaurant. The Pittmans named the restaurant after a mannequin Ray Pittman acquired during his days as a Shriner. Dressed as a Hawaiian dancer, it served as decoration for the Shriners’ pig cooking contests and later delighted customers at the concession stand. “We would tie her to a telephone pole next to the stand whenever we were open and people would stop and take pictures with her,” Pittman said. They named her “Nutmeg,” and today she holds court in a corner of the Hula Girl Grill. To expand their company’s reach, the Pittmans in 2014 rented a building a block away and started Hula Girl Catering and Venue, with a kitchen and dining space for 100 that allows them to host events. They also cater events off premises, including unusual places – like the Amtrak trains that stop at the Selma Depot. At its annual meeting in January, the Smithfield-Selma Chamber of Commerce named Ray and Rose Pittman the 2014 Jimmy Creech Small Business Persons of the Year. Even with 15 employees and without their full-time jobs, the Pittmans are still working long hours and rarely take a day off. * Think long and hard before you start your business, especially if it is a restaurant. It is the hardest work you will ever do in your life. * Do your homework first. * Despite the hard work and long hours, it’s worth it. There’s nothing better than being your own boss.